Performance Sailcraft teamed up with Farr Yacht Design, Ltd. to mastermind the Mega Byte - undoubtedly the best new performance one-design dinghy for 2000 . Their goal was to create a boat that could be sailed with two crew or raced singlehanded. Long before Farr Yacht Design Ltd . established its presence as one of the preeminent designers of offshore racing yachts, Bruce Farr and partner Russ Bowler had already established themselves as world class dinghy designers and helmsmen. 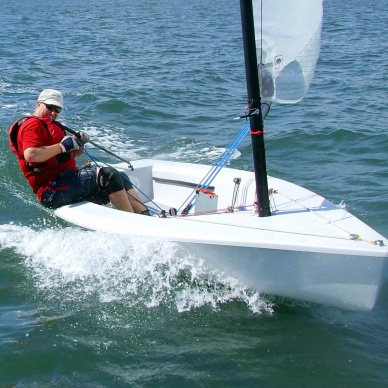 So, while a dinghy design by the Farr office might be a surprise to some, it was not to Ian Bruce , himself an international calibre dinghy sailor and one of the owners of Performance Sailcraft , who just happened to be looking for a new boat for his company.